Gerald Shea explains how he developed his own ‘transitional’ language. The memoir genre has been often criticized as narcissistic navel-gazing, a wallowing in personal problems. Memoir writers, this critique goes, glorify their own behavior (however foolish) while blaming the rest of society for their problems. Enter Marblehead resident Gerald Shea, whose life story easily could have been a tale of self-pity. 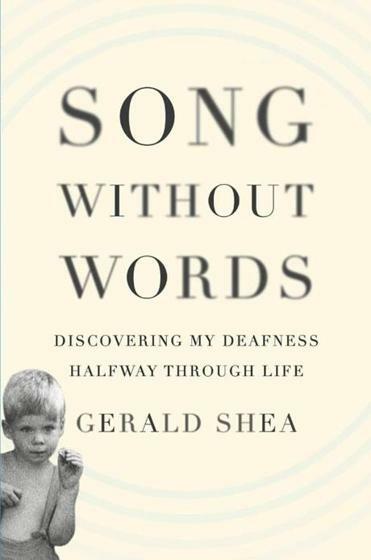 Instead, Shea’s “Song Without Words” constitutes everything that a great memoir can and should be. Shea contracted scarlet fever as a boy, and as a result became profoundly (not completely) deaf. He wouldn’t be professionally diagnosed until age 34, thus compelling him to live a lot of his life, said one of his doctors later, as if he were running with a broken ankle. Shea simply carried on, working twice as hard to overcome his hearing loss. He would graduate Columbia Law School near the top of his class, then become a partner at a big Manhattan law firm, Debevoise & Plimpton. Shea describes what he needed to do to reach such heights with clarity and without complaint. “Song Without Words” is both a work of literary art and a manual for understanding the difficult world Shea inhabits. Instead of complaining, Shea patiently portrays what it’s like to be unable to comprehend spoken language in real time, and how he brilliantly developed his own “transitional” language, which he calls “lyricals,” and then translates these lyricals back into English. Shea describes the biggest challenge of his life: the lost time (in the Proustian sense, too) between what people say and what he understands. Sometimes, meaning is simply lost in translation. In his work as a high-powered commercial lawyer representing Fortune 500 companies in multi-billion-dollar deals, being unable at times to understand others became a massive professional obstacle. Shea succeeded, but the toll it took on him emotionally and physically, the lunches he spent in the bathroom sipping Mylanta from the bottle as his stomach churned with stress, was significant. Shea is impressive that, with so much to complain about, he complains so little. Shea beautifully describes the language of the sounds he hears, letting us see how he races to translate them into meaning. At a meeting with the New York City Builders Association, for example, Shea hears another lawyer say “any fissing of the pride of lament would violate the antitrust law.” Shea translates: “lament” becomes “cement”; “fissing of the pride” becomes “fixing of the price.” Like deciphering James Joyce’s “Finnegan’s Wake,” reading Shea’s lyricals can be both poetic and breathtakingly difficult. Sometimes Shea is unable to piece together meaning from his lyricals, especially when negotiating with non-native English speakers. To say that he spends much of his life desperately playing a game of catch-up doesn’t begin to explain Shea’s dramatic efforts. That Shea actually succeeds is a miracle brought about by sheer, grind-it-out determination of Olympian proportions. When Shea finally gets a hearing aid in his mid-30s, it helps but doesn’t eliminate the lyricals. He sits on a bench near a field and listens: “the chorus [of crickets] came from everywhere . . . stretching in from over the hills and fields and pouring into my electrified ears. I turned around in circles to hear it, a melody. . . coming from every direction.” Once Shea accepts his disability and begins to seek help, his life changes from one of absolute professional focus to one that better values himself and his family. Eventually Shea decides he doesn’t want to grind out 16-hour days and guzzle Mylanta. He gives up his job, and begins to focus on both his family and his hearing loss. Readers are lucky that Shea took the time to write this masterful memoir, which brings us into a hidden world so few have ever visited. “Song Without Words” proves that memoir, at its lyrical best, can be a truly wonderful and inspirational literary genre.